July 20th we would like to invite you out to Krazee Kafe to enjoy a fundraiser drive for our fallen brother Travius HK Davis﻿. Donations and profits will go to his parents to help fund for his services. 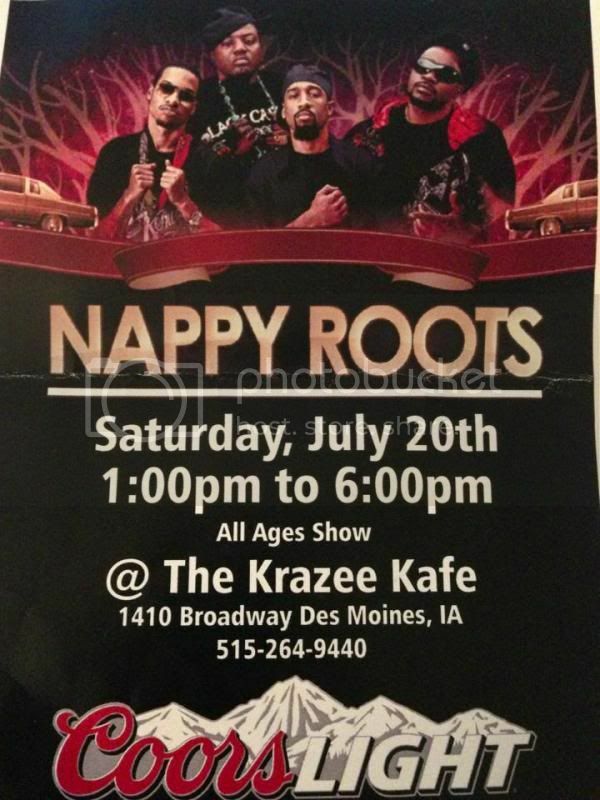 We'll have wristbands hopefully some t-shirts and tickets to see the band "Nappy Roots"
We will also be holding a small car meet as well as our "515 Get Down BBQ" meet for the summer. Parts of the parking lot will be blocked for car meet vehicles and bikes. WE DO ASK THAT PLEASE RESPECT PEOPLES VEHICLES AND THE PROPERTY! DONT NEED ANY REASON TO HAVE COPS CALLED TO THIS TYPE OF EVENT FOR SOMEONE BEING STUPID SO PLEASE ACT LIKE ADULTS! Nobody is going to this? I'll be attending I'll try and round some decent folks up aswell. Don't really have anything cool to show off anymore, but the girlfriend and I will be there to show support. NSXY will be there... if I dont forget about it. Should just get a new plate...NSXYer. If you don't have a ride its cool, just come out and support and have a good time!! Hope to see most of y'all Saturday!! Last edited by bludevil2982; 07/18/2013 at 11:43 PM. Anybody doing a little pre meet then rolling out to this? Just got my motor in and should be ready just in time. We can set something up .. I'd be down for that. Anybody have a spot they think would be a good spot? How bout bowling alley parking lot behind bbops on 14th and Euclid? I was thinking more along the lines of a car wash then head out cause the one by that bowling alley got shut down. How bout the car wash on se 14th next to Tasty Tacos? That's the one I was thinking about. K lets shoot for 11-11:15am?? Yep I'll b there problly closer to 11:30 still wrenching trying to get my pile ready got a few things to pick up in the morning first thing. Sounds good .. I'll be doin the same thing .. have a few kinks I have to work out! !